This tutorial explains how to create a Scavenger game in Loquiz where teams start each from the different starting field and then continue in a circle. Next task only appears on a map when the previous is answered. When all the tasks are answered FINISH pin will appear. You might want to use this case to accommodate traditional team exercise sets to make teams follow a certain order. On Loquiz PRO webpage click “New game” and choose “Scavenger” as a game type. 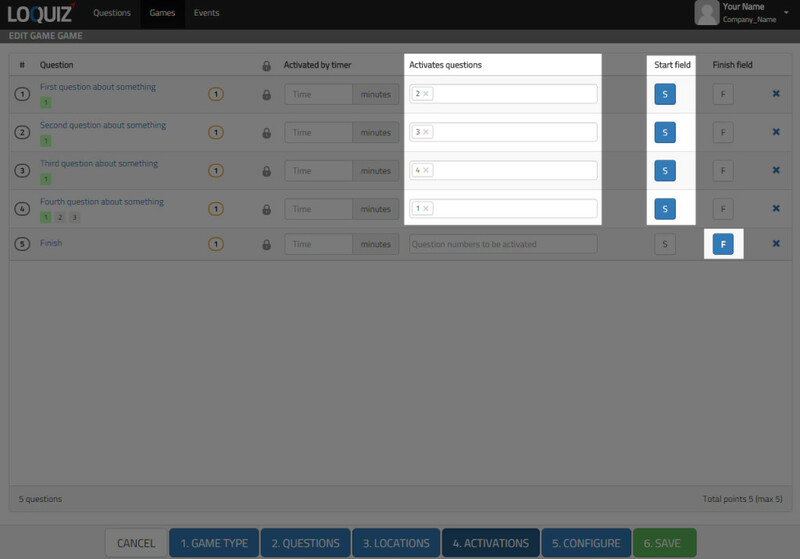 Next you can add tasks on “Tasks” screen. If you do not want to use tasks, use “No answer” type of task (you can even briefly display the exercise there). You can use all the tasks’ rich attributes that Loquiz provides. You need 1 piece of content for every location and you need an additional piece of content for finish point. So if your exercise set is 4 assignments, add those 4 and then create one specific “This is finish” task. In case you do not use location-specific tasks assign locations to each task. You can do it on “Locations” screen. Location is the place where this piece of content (e.g. task) pops open. Make sure that locations marked in PRO are exactly where your exercises will take place in the game (if using physical props). Finish location should be where you want the teams to come when they have visited all the tasks’ locations. You can do it on “Activation” screen. First, you should create a circular activation sequence for the tasks. So that answering task no. 1 (Q1) brings task no. 2 (Q2) to the map. Q2 should activate Q3. And answering Q3 makes Q4 visible. You also need to make sure Q4 activates Q1. Next, mark all actual tasks as starting fields (Q1-4 should be all marked as starting points). Make sure that finish location does not have any activation rule set to it and that is marked as finish (F) and not marked as start (S). Do it on “Activations” page. The most important setting you should mark is: “Rotate start fields”. Then all teams will get separate starting field. If you can not see this setting you have not set the starting fields, go back on “Activation” screen and set them. Now, what will happen is this. When team starts the game, they will get one task from the list of starting fields and it is shown on the map. Starting fields are assigned to teams in sequence, so that 1st team to start gets task no 1, 2nd gets 2, 3rd gets 3, 4th gets 4. Fifth team to start gets 1 again etc. At the beginning of the game only one starting point is shown on the map. After team visits the first task, the next task will appear on a map. For team 1, second point is 2, but for team 2 the second point is 3 etc. For team 4 the second point is 1. Players do not actually see the task numbers, they see task scores (difficulties) on the map. Finish will become visible only when all the checkpoints have been visited or when game time runs out (if game time limit is set). Check this tutorial if you want to make teams to follow different routes.